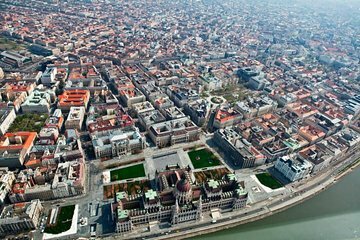 Vivi una vista a volo d'uccello su Budapest con un emozionante volo panoramico. Ti verrà servito un bicchiere di spumante ungherese prima di salire a bordo di un aereo privato da 4 passeggeri per assistere a una vista spettacolare della città. Sorvola il Palazzo del Parlamento, il Castello di Buda e il famoso Ponte delle Catene e goditi le vedute aeree del Bastione dei Pescatori e le statue del Momento Park. Il tuo volo privato inizia con un pick-up mattutino o pomeridiano nel tuo hotel di Budapest, dove il tuo autista ti porterà all'aeroporto di Budaörs. Goditi un bicchiere di spumante ungherese al tuo arrivo e poi sali sull'aereo a 4 passeggeri. Allora sei fuori! Il tuo pilota indica le migliori attrazioni mentre vai. Ammirate le splendide colline di Buda e le strutture cittadine di Pest e ammirate i bellissimi ponti che si estendono attraverso il Danubio, come il famoso Ponte delle Catene e il Ponte Elisabetta. Mentre vi librate sopra, ammirate l'imponente Palazzo del Parlamento e l'intricata distesa del Castello di Buda, sito Patrimonio dell'Umanità dell'UNESCO. Scatta foto delle statue comuniste appiccicate al Momento Park e l'imponente cupola della Basilica di Santo Stefano. Il tuo pilota si assicurerà di andare in giro in modo da catturare i siti che ti sei perso la prima volta. Il tuo tour si concluderà con il rientro al tuo hotel. We were lucky to have a beautiful sunny winters morning. Unfortunately, the car to the air field didnt arrive and we had to call the tour organiser, who promptly organised another car. The flight itself was great. The pilot gave us a great view of the castle area, citadel and Memento Park. The 25 minute flight was the best thing we did during our visit to Budapest. Never received the video tho....would be nice to have it and show it to my dad. Not sure if you can help me with this? I did not have the details of the gentleman who collected us in Budapest? As a private pilot it was really good to get to see a Hungarian General Aviation airfield. I was picked up from the hotel and driven to the field. Weather was marginal but it was decided we would go ahead of a squall line that was coming in. The aircraft used was a recently refurbished Cessna 172 which was immaculate and my pilot was an hours builder. We stayed on the Buda side of the river to keep outside the TCA for the international airport which I could see in the distance. It was fascinating to see from the air the sites we had previously visited on the ground and overall while the flight seemed very short it was very enjoyable. Un moment vraiment exceptionnel ! Chauffeur très sympathique, petite coupe de mousseux avant le décollage. Le pilote était très gentil, à bien expliqué et montré. Je ne peux que conseiller ce moment vraiment magique qui restera gravé dans ma mémoire ! It said 30 minutes in the air. We were up in the air maybe 15. We didn't get close to the any of the good sites but we all did champagne before we took off so that was nice. We went on this trip three weeks ago. The driver who picked us up from our hotel was excellent. He took us to the small airport and chatted to us on the way. The pilot didn't speak to us at all and didn't point out anything. This was disappointing as it would have been useful for him to identify places for us but he didn't utter a word. The flight was very short and certainly not 30minutes. We were promised a video of our flight but it has not arrived. We booked a scenic trip over Budapest and it was great. The weather was quite windy and the plane was small so it did get buffetted about a bit but the pilot was excellent and took us all over the city to view all the sights and then made a superb landing. We were couriered in and out from our hotel and it all worked very smoothly. An amazing, once in a lifetime experience : Everything was perfect from pickup to the flight itself. Would highly recommend! this was fantastic! First, the guide that picked us up at the hotel was very kind and nice. The flight itself was great, it gave us a very good idea of the city, we could see from above how beautiful it is. I highly recommend this experience!